After blitzing the cauliflower florets, place in a pan with the coconut oil and cook over a moderate heat for 8-12 minutes until cooked through, but not completely soft. Season with sea salt and set aside to keep warm. Combine the ground beef, onion powder, garlic powder and salt and form into two burger patty shapes. Heat the coconut oil in a pan and cook the patties on both sides until cooked to your liking. Remove and set aside to keep warm. Use the same pan and add a dash of coconut oil (if needed) and cook the onions over a moderate heat until softened. Add the garlic and mushrooms and increase the heat slightly to caramelize the mixture. Pour most of the beef broth into the pan. Reserve 1/4 cup of the broth and whisk with the arrowroot powder. When the mixture in the pan has reduced a bit, add in the arrowroot mixture and cook for 1-2 minutes more to reduce to a thick gravy. In the meantime, peel and slice the avocado and dice the beetroot. 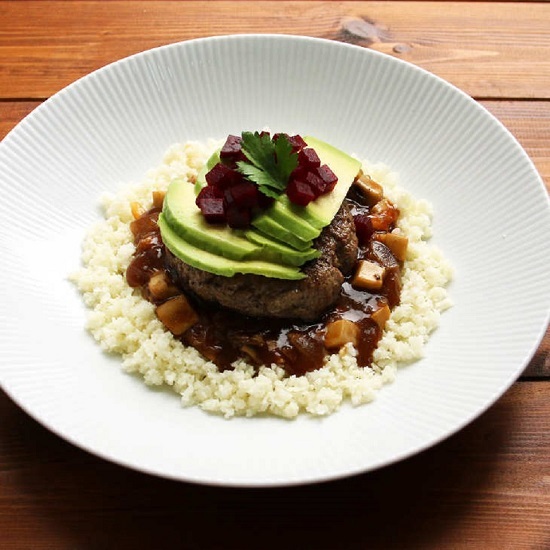 Serve the burger patty over the cauliflower rice (on which you have spooned the gravy) and top with the sliced avocado and diced beetroot. This is no ordinary burger. Take one bite of this satisfying, deeply flavored version of the Hawaiian classic and you’ll want it in your regular recipe rotation. 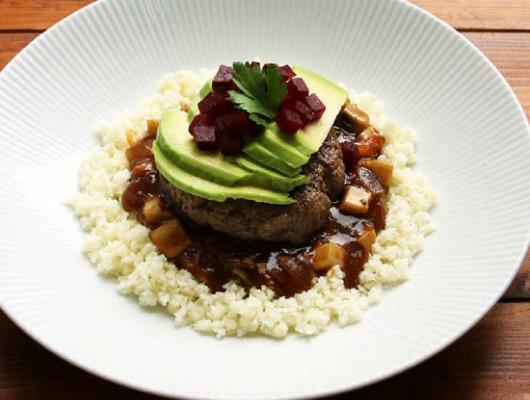 This version is topped with creamy, high-fiber avocado and delicious diced beetroot.